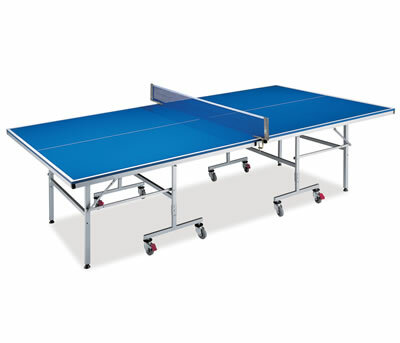 Sturdy full-size professional indoor table in blue and silver finish. 15mm thick high performance board, strong 20mm x 30mm tubular steel undercarriage. 8x75mm diameter metal/rubber heavy-duty 360 degrees rotating wheels (4 lockable). Quick & easy fold-up for instant close-fit storage, playback facility for solo play, 2 quality bats, 3 balls plut net assembly included. Optional waterproof cover & wheelchair friendly.